Ferrari have spent the last few races watching helplessly as a once-commanding championship lead for their driver Fernando Alonso has been turned into a narrow deficit by the revived steamroller that is Red Bull and Sebastian Vettel. Where Red Bull have significantly improved their car, Ferrari have effectively stood still, and they have been quite open about the fact that they are struggling to introduce new aerodynamic developments. This, they say, is a result of a lack of correlation between the results they are getting from their wind tunnel, a crucial tool where new parts are tested, and the effect when those new parts are put on the car on the track. That is a major concern - and especially so because it has been going on for two years, with Ferrari intermittently thinking they have got to the bottom of the problem, and then realising again that they haven't. An F1 car's performance is 80% dictated by aerodynamics. They are developed by a wind tunnel and by using a computer programme known as computational fluid dynamics (CFD) . If a wind tunnel is running correctly, it is the best way to develop a car, while CFD is a good tool for understanding airflow around the car. A wind tunnel is a complicated device used to simulate a complicated phenomenon. In effect, a racing car is travelling at a speed over the track but the mass of the car is moving slower because it is pushing air in front of it, with the exception of the parts that are producing downforce - such as the front wing, diffuser and rear wing, which energise airflow and make it go faster. What you're trying to do is minimise the amount of air the car is pushing forward and maximise the speed of the airflow over it, because that creates downforce. In a wind tunnel, you have air being blown by a fan, the road rolling and the car sitting still. It's a very different environment from the track. You want the airflow in front of the car - what is called the boundary layer - and the rolling road to be at the same speed. To do that is an absolute nightmare, and they never will be the same. Another problem is that the size of the models the teams use has increased over the years - most now use a 60% scale model - but the size of the wind tunnels themselves has not. That can mean that the airflow coming off the car hits the wall or the roof, which changes the airflow over the car. The result of all that is that, in reality, the wind tunnel and the track will never completely correlate. To successfully read the wind tunnel results, therefore, the group of people running it has to understand what is important - you need the people there to see past the raw data and understand what it means. In short, I don't think the problem Ferrari are trying to fix can be fixed. And they created another problem for themselves by going to use another wind tunnel - Toyota's in Germany, left over from the now defunct Toyota works F1 team. So they have results from one wind tunnel, different results from another, and more results from CFD and they're standing in the middle scratching their heads. Shutting down their own wind tunnel, as they are going to do, is the right thing. It takes out of the equation one extra thing that can mess them up. Before India, they also went off and did some straight-line testing. That is very important - you can do a ride-height map and match that to the wind tunnel, you can see when the diffuser and front wing stall more accurately. You'll see a lot of stuff that will help you understand the aerodynamic map of the car a bit better but you won't see what happens when the driver turns the steering wheel, and that is the important bit. It defines how fast a car goes around a corner. It's very difficult to simulate how the airflow works as a car goes around a race track, so you need a group of people who can read the data you do get and understand the off-sets. Otherwise, you are wasting all your time at a race track and you'll never get it sorted. I still believe Ferrari missed the basics of the aerodynamic package of the car this year - the exhaust outlets still compromise the airflow too much in the important 'coke-bottle' area between the rear tyres. When they changed it for the Spanish and then Monaco Grands Prix in May, they made it better and said there was another step to come. But they haven't taken that next step. Red Bull, by contrast, have developed their car from being not so good at the start of the year, to one that was better and which they could develop further. Red Bull have been making small changes all the time. You had to look twice to see the change they made to the rear of the sidepods in Korea, but the effect of it was big enough to justify a completely new rear bodywork package, which is not cheap or easy. And the small amount of change needed to make the 'coke-bottle' work better, Ferrari could do that tomorrow, and make 10 times that change, but they haven't. So there is a lack of vision there in terms of seeing where they're trying to get to with the car. And that's the main problem. Ferrari lack a visionary - someone like Red Bull's chief technical officer Adrian Newey. That doesn't mean they can't build a good car. They have - it started bad and it got better. Since the Spanish Grand Prix it has been there or thereabouts, but never actually the quickest. Combined with Alonso's consistency it was enough to build a decent championship lead by mid-season. But as Red Bull have come on strong, Alonso has lost his advantage - not helped by being taken off at the first corner in two of the last five races. 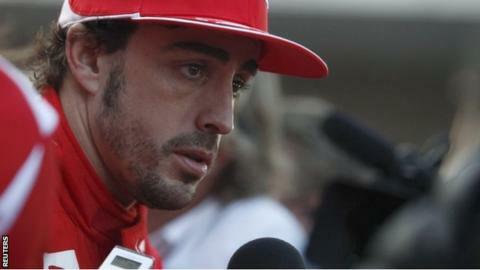 But as this year has proven, whether that is enough to beat Red Bull over a full season is another matter. They might have to take a step backwards to go forwards. They stated ahead of this season that they had taken a deliberately aggressive approach to the design of their car. But I don't understand what that is. You only design something that is going to be better - stiffer, lighter or produces more downforce. If it isn't at least one of those three things you can be as aggressive as you like, you're not going to progress. Gary Anderson, BBC F1's technical analyst, is the former technical director of the Jordan, Stewart and Jaguar teams. He was talking to BBC Sport's Andrew Benson.